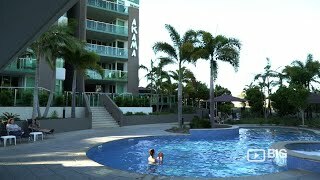 Akama Resort - A luxury complex offering spacious one, two, three bedroom and penthouse apartments on the Esplanade overlooking the Marina and The Great Sandy Straits out to Fraser Island in Hervey Bay. They are ideally located opposite the marina which boasts some of Hervey Bay's best bars and restaurants. Enjoy the private sunny balconies with their stunning views, relax in the beautiful lagoon pool and spa, enjoy the benefits of the well appointed barbecue area or prepare a sumptuous meal in the fully equipped designer kitchen. Spacious open plan apartments with everything at your fingertips. Tour desk offers numerous activities both in Hervey Bay as well as nearby island adventures. Luxurious spacious rooms with high ceilings; built in robes, air-conditioning, LCD televisions, broadband connections and largeking beds. The three bedroom apartments have one king bed and four king single beds and two bathrooms. The stunning one bed apartments have one king size bed, LCD television, and all the kitchen modern conveniences you could possibly require and it adjoins the spacious lounge, dining which is all open-plan. There are nine foot concertina glass doors that open up the full width and height of the lounge room onto a sunny balcony bringing the outside in. Views from your bedroom and balcony over the pool, spa and barbecue area at the front of the resort complete the picture. Hervey Bay's newest Penthouse is now available. 200 square metres of pure pleasure, 55 square metres of balcony with stunning views over great sandy straights and Fraser Island, eight metre concertina doors opening onto the balcony, barbecue, sun lounges, three bedrooms, two bathrooms and luxury living. The Deluxe penthouse has one king bed, one queen bed and two king singles. Luxurious spacious rooms with high ceilings; built in robes, air-conditioning, LCD televisions, broadband connections and large king size beds. Seating for six inside and out with a large private sunny balcony complete the picture. The two bedroom apartments have one king bed and two single beds and two bathrooms. The three bedroom penthouse apartments feature larger living areas, huge balconies, and luxurious spacious rooms with high ceilings, built in robes, air-conditioning, LCD televisions and broadband connection. The three bedroom apartments have one king, one queen and two king single beds.